From building family trees to taking genetic tests, people want to know where they came from and how their families evolved culturally. But for people with enslaved ancestors, tracing their lineage comes with hurdles. Documentation about enslavement normally resides in collections spread across eight universities, and seldom with families. To help families and scholars search for enslaved individuals and their descendants, Michigan State University researchers are launching a new project called “Enslaved: The People of the Historic Slave Trade.” Their goal? To provide an unprecedented online database about American slavery. What is the database? Michigan State scholars gathered eight online databases from multiple universities to generate a massive central hub. At its epicenter, the researchers will engineer new tools that analyze where enslaved people ended up during the Civil War era, along with descriptions of who they were. Users can search for these details in the eight databases, which contain old plantation records or piecemeal documents collected by many researchers. This way, anyone can create maps and charts of enslaved populations throughout the United States. Why it matters: Race dominates American conversations, and historians frequently look back to the Civil War era to understand persisting race issues. But for a long time, genealogists and historians had to rely on fragmented records, such as sales and ownership notes, probate documents or runaway slave notices to better understand family histories complicated by slavery. Names were often omitted or misspelled. 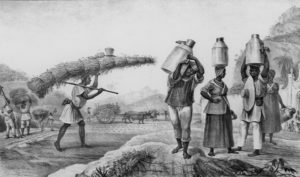 Job titles–such as a carpenter or farmer–were inconsistent or labeled differently in multiple records. So the greatest hope for the new hub is that families and scholars can piece together the larger puzzle of enslavement by cross-referencing documents from multiple places that could identify individuals by name or description. “If you knew your ancestor was at a particular plantation, you could find out about all those people at this particular plantation and look at the larger picture of your ancestor’s life,” Rehberger said. When will it debut? Rehberger and his colleagues spent years developing the hub but recently received a $1.5 million grant from the Andrew W. Mellon Foundation to finally create it. Currently in development, “Enslaved” will take about 18 months to finish a proof-of-concept version, and Rehberger and his team plan to launch the website by mid-2019.